It's getting' festive up in here, folks. Passover starts tomorrow at sundown, so naturally we got into the holiday spirit by... dying some Easter eggs. What can I say but that we are obviously fully committed to confusing our children at every opportunity. I don't know what's happening to me, but I bought a glue gun and spent way too much time over on Pinterest looking up how to make an Easter egg tree. Somehow I can't find ten minutes to shower, yet I have plenty of time to waste surfing craft boards for a holiday that I don't even celebrate. I admit that I actually enjoyed myself a little bit and I'm kind of ridiculously proud of the fact that I managed to execute a crafty type thing without burning my house down. Oh, and it looks kind of cute, too. The Hubby is the one who came up with the idea for the tree, as apparently this is some sort of tradition in WASP-centric areas of the East coast (I'm looking at you here, Connecticut) and his family used to make one every year. 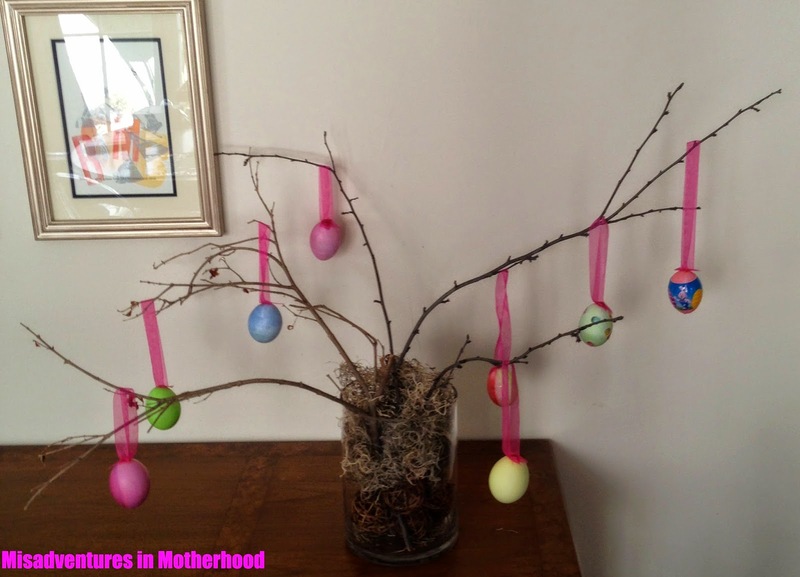 I suspect that my Mother-in-Law's Easter trees were a bit more "folk art" than "dead twig from the garden", but you gotta work with what you got. Get your spouse involved. Since I don't know how to blow eggs (or men, apparently), I forced the Hubster to participate in my craft project. 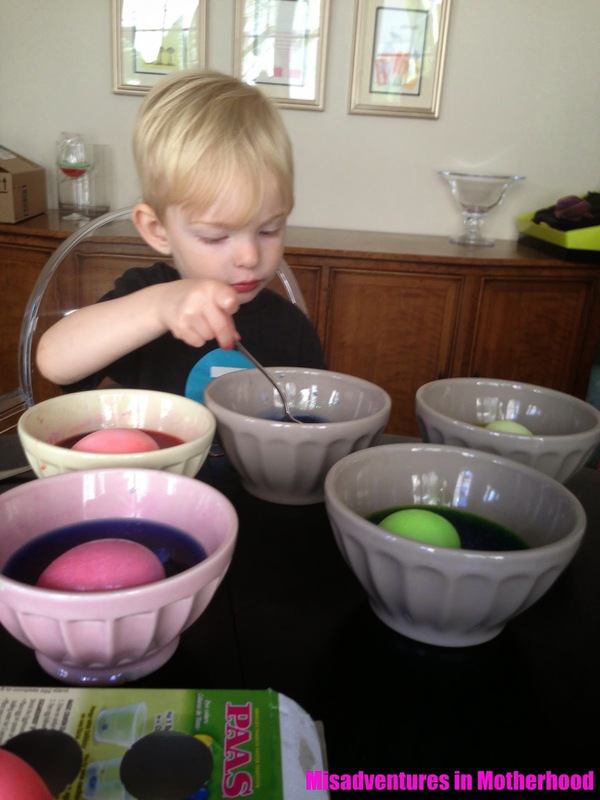 I think he secretly enjoyed himself, though I now have a bowl full of unseparated eggs and no idea what to do with them. Use child labor. 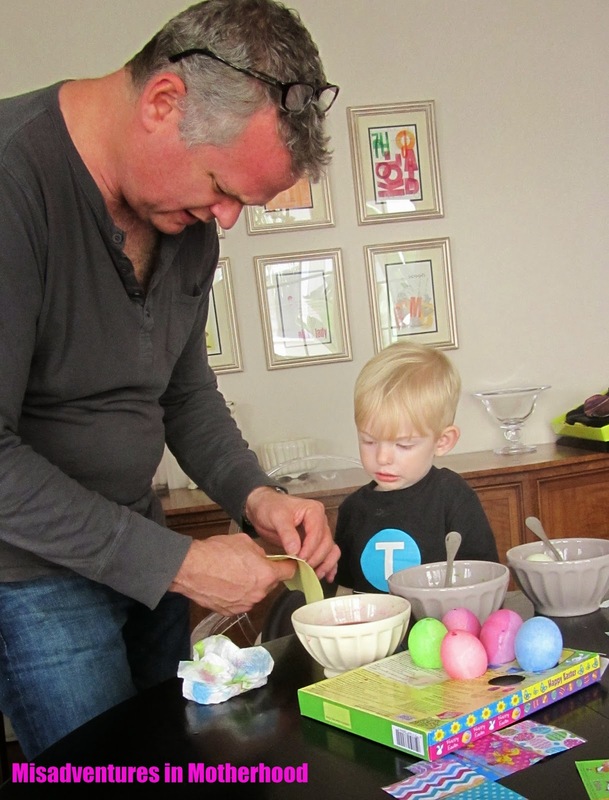 Why dye eggs yourself when you have small human thrilled to do it for you? 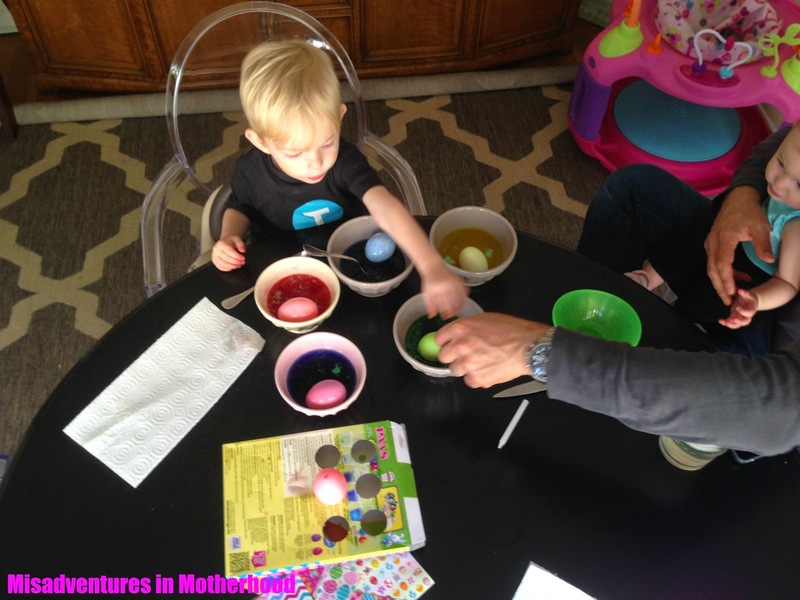 Obviously, if you're an OCD perfectionist, it will probably really bother you to have a tree full of puce colored eggs, but at least it will keep your children busy for ten minutes while you have a glass of wine/check Instagram. Repurpose old gift ribbon. I'm all about going green as long as it doesn't involve using cloth diapers, so I found some old ribbon leftover from my birthday and used that to make the hanging loops. My hot glue gun was the perfect thing to secure the ribbons to the eggs. I suspect you could probably use fabric glue too, but you'll have to get confirmation on that from one of those Pinterest people who hang out at Michael's crafts. Get your child and spouse outside. Giving a toddler permission to pick up sticks and bring them inside is like Heaven on Earth for the under-three set. Send your small human and your partner outside with instructions to find some twigs or branches perfect for holding Easter eggs. If you live in a large urban environment this will take a significant amount of time and you will be able to enjoy your wine and/or order dinner in peace. Justify your Target clearance purchases. The moss and the vase filler were both items that I snatched up on the clearance aisle at Target. I had no use for them when they were purchased, but they were too cheap to pass up and I just knew that I would want these weird items eventually. Five years later, I'm so glad that I had them stashed away! The vase is one of those free ones that came with a floral arrangement that I was planning to sell at my garage sale, so I guess my own trash has turned into my own treasure. 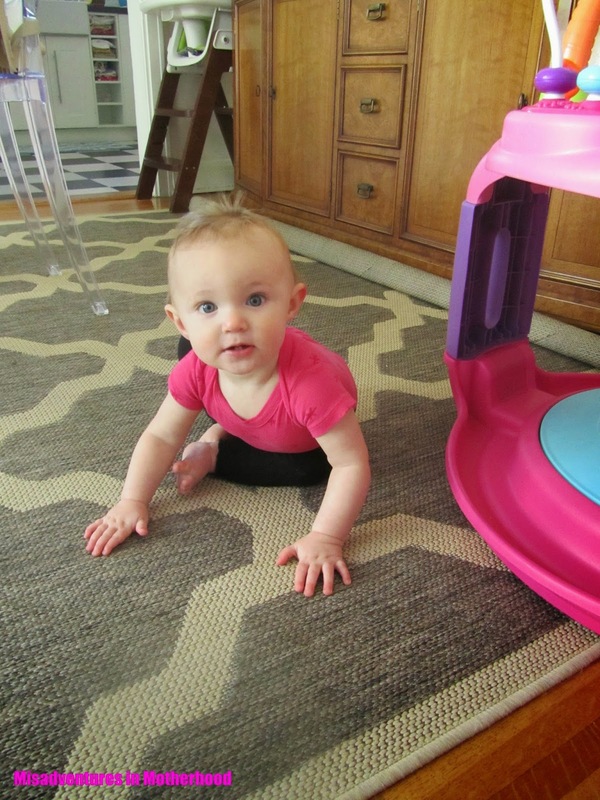 Pat yourself on the back for doing something positive that involved your children. Holiday crafts are parenting gold, people. Sure I could've tried to make natural Easter egg dyes and used eco-friendly chalk paint to turn my twigs white, but ain't nobody got time for that. I threw this sh*t together at the last minute and it looks good enough. These days good enough is more than enough. Happy Passover and Easter, my lovelies! Here's hoping the wine is cold, the repast is tasty, and the chocolate eggs are Belgian.